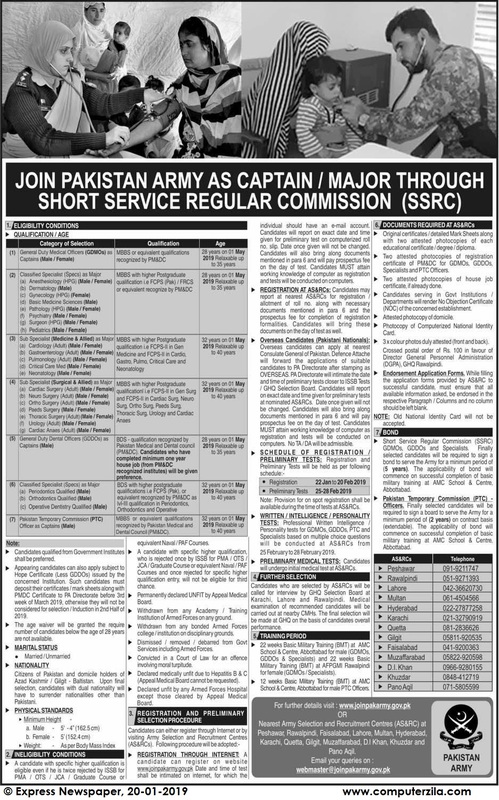 Join Pakistan Army as Captain/Major through Short Service Regular Commission (SSRC) at Pakistan Army (PAKARMY) in Dera Ismail Khan, Faisalabad, Gilgit, Hyderabad, Karachi, Lahore, Multan, Peshawar, Quetta, Rawalpindi, Khuzdar, and Muzaffarabad Cities. Pakistan Army is a Government Organization which requires employees for General Duty Medical Officers (GDMC), Classified Specialist, and General Duty Dental Officer (GDDO) Jobs in cities Dera Ismail Khan, Faisalabad, Gilgit, Hyderabad, Karachi, Lahore, Multan, Peshawar, Quetta, Rawalpindi, Khuzdar, and Muzaffarabad. Join Pakistan Army as Captain/Major through Short Service Regular Commission (SSRC) for General Duty Medical Officers (GDMC), Classified Specialist, General Duty Dental Officer (GDDO), Candidates having MBBS and BDS degrees can apply.